There's currently photos of an 11-year-Old fashion designer identified as Ufuoma whose creative work of designs has caught the attention of many. 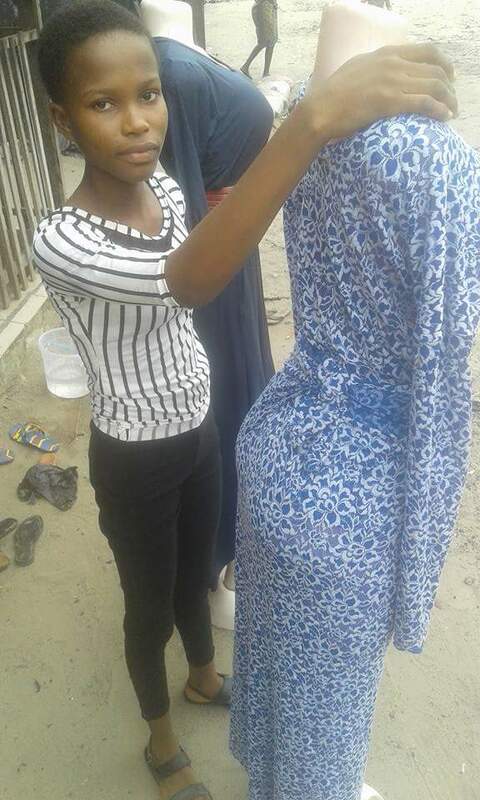 According to an insider who goes by the name "Omonire Ovwigho Isaac" on facebook, the aforementioned girl is a student of Peace Child Secondary School, Agbarho (SSS1). 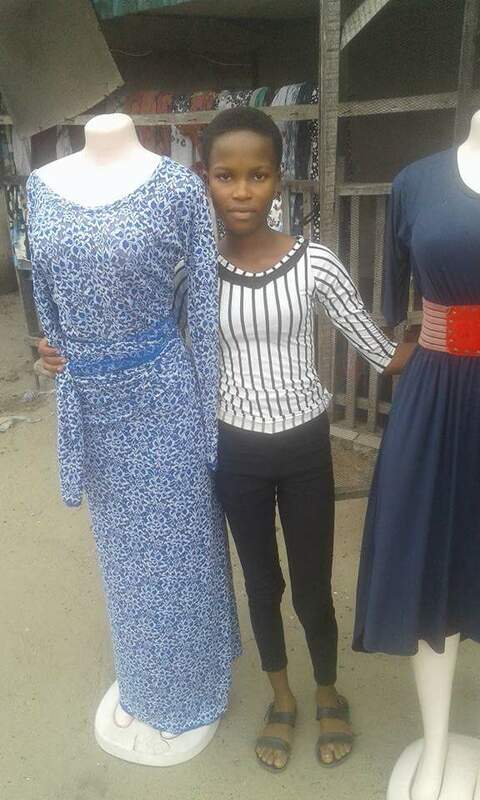 Ufuoma started about two years ago learning how to sew from her mum (my biological sister) whenever she returns from school and be with her during the weekend. But we don't permit her to do such when her exams approach so that she could concentrate on her exams. And we don't need to talk about her knowledge here. But she's good. Now, let me briefly say something here. Ufuoma is my niece (my eldest sister's daughter), but her mum and I are just too close to an extent I address all her children as my brothers and sisters. I don't find it comfortable calling them nieces or nephews. Ufuoma's mother is a mother of five that we're so close that I find it more comfortable calling her children "my sister and my brother," instead of niece and nephew. We confide in each other. She's just too good to me as a sister. She's always been there for me through thick and thin. I notice her distress when there's any challenge. But after noticing such thing, I'd go home, think and then come out with my piece of advice to give to her and she always uses the advice and it works out. We sat down and I told her "since certificate is failing us in a nation where connection speaks volume and not what your certificate says and what your brain carries, why not engage your children into one of two apprentices after school hour?" She saw reasons with that and we both agreed on it and it came to pass. And all her children, they go to school and still learn work. Even the ones in higher institutions when they come for holidays, they also go to their workshops to learn their works. I have passed through hell in life and; if hell is real, God would have mercy on me because he knows I have passed through hell. And I would never allow anyone from my family coming behind me to pass such hell. And that's why I sit, think and counsel my sisters about their children. And Ufuoma's mum, when it comes to sensitive issues, she doesn't do them without consulting me no matter how faraway I am from her. There was a day she called me and told me to my face, "Igho, uchebro na vwo kevwe na, konyi chavwe ukona." Which means, "Igho," because Igho is what they always call me, "that advice you gave to me is what is really helping me now o." And yes, some many of us started business and it boomed but suddenly the booming begins to go down the drain. But have we really sat down to ask ourselves what have I been doing differently from when my business boomed and now that it no longer booms? Is there something that I am not really doing? Every business has trend and you follow new trend when there's change. Sometimes we should also carry out research and feasibility about about our existing business. We should apply new strategies because we can't stay in this competitive world with old fashion (old ways of doing things) in the long run. Whenever there's change in taste and fashion, change along with it. And do not make super profit priority your first priority because super profit kills business faster than anything else. You could cheat on some of your customers with little margin. That's still considerable. But, if you cheat on them with higer margin, do not expect them again if they find out in another place you've been cheating on them without mercy. Because the most painful thing to some customers is when you cheat on them yet you tell them you're just helping them and that things are very costly yet you sell to them at lower rate. That's absurd and very painful. Well, I am so proud of my sister's children for making us proud. I am so proud of my sweetest sister, the best sister in the whole world for having a listening ear. When you're closer to someone to know more about him or her, you can think positively for such person if he or she has listening ear. And to some people, they don't deserve advice. Because they take advice as an insult to them. So, if you come across such people, even if death is approaching them and your advice could help save them, just don't think of dishing out your advice to them. Let them have their death. Presently, we don't joke with education. But, we still don't have to joke with hand work. We do not need to put all our hopes on certificate. Life is not funny here in this part of the world. And we must do everything humanly to raise the expectations of our children. Parents need to parent. 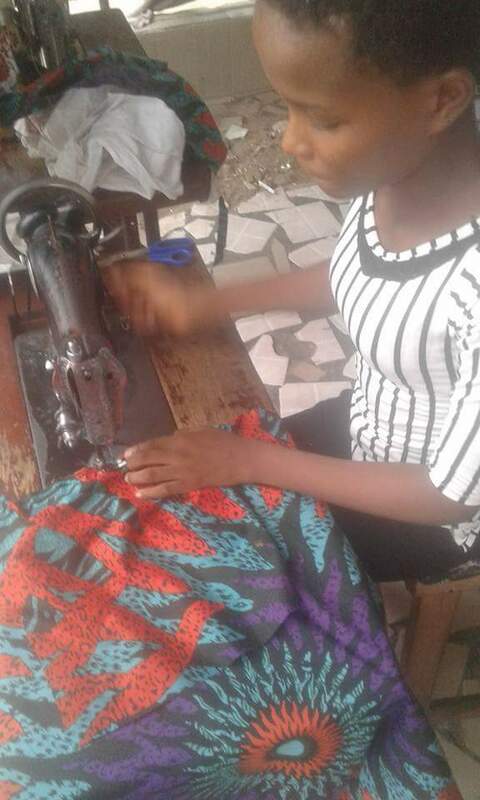 Today, most of the clothes Joy and Rejoice the elder and younger sisters of Ufuoma wear are being sewn by Ufuoma. You see, there are people with workable ideas in Nigeria. But the system is not encouraging them to bring out the best out of them. You may have the real ideas that could turn a million into millions in few years time. But when you look at your right-hand, there's no helper and when you look at your left-hand, there's no start-up capital and you become a frustrated human being. Government would announce on National dailies that the Nigerian graduates should come and take loan to start up their own businesses with their certificates as collateral. But after getting there with your certificate hoping to access soft loan that's not soft enough, they would ask you for landed property for collateral. 😄😄😄! Sometimes you laugh in Nigeria when you're supposed to cry. What an irony! Nigeria, funny nation with funny institutions and leaders. Now, the same money the same government sets aside for unemployed graduates to get soft loans with their certificates to start up their own businesses would be given to their own children without positive ideas to waste abroad without single refund of the money to the government purse. The system stinks. And I would advise the poor and middle class parents to live beyond white collar job and find alternative for their children while they're in school. Sacrifice for your children. Even if you don't have money to sign them into any work, approach the nearby workplace or workshop, meet the boss and solicit for help for any of your children. If you're good and technical with words, someone would definitely have mercy on you and see reasons to help train your child for free without even taking a bottle of drink from you. And also give your children hope that there are better days ahead no matter the current situation. Speak positively into your children because there's power in words. We understand that so many parents fail and shift their blame that a child that would be good would be good and the one that would be bad would be bad. No! Don't even think about that. Know when your child is to be indoor and outdoor at their early stage. Correct them with cane from their tender age. Don't spare the rod because the scripture says, "you spare the rod and you spoil the child" and; correct them with words when they've grown-up to have sense of belonging because words hurt adults than cane and cane hurts children than words. Do not ever support them at their tender age whenever they're wrong especially when they do wrong outside. If they're beaten outside for doing wrong and they cry to you, make them to understand that they deserve what they get and don't think of wearing trouser to go and fight for them. Quarry them if they bring wrong report to you and encourage them if they bring good report to you. Children you see learn faster than adults. So, as you fight for them for every wrong they do from their childhoods, then expect the worse child from them someday because they believe that even if they commit the biggest crime they have parents that would fight for them instead of quarrying them. Do your bit and pray for your child. Give the word to your child because there is power in words.